Before he was launched into international superstardom in 1999 with the iconic Supernatural, Carlos Santana and the band had been widely known as a phenomenal live act. In addition, over two decades of constant touring had honed Carlos' skills on the guitar to a fine point. 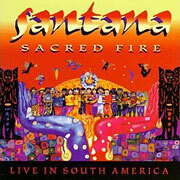 Arguably at the top of his game on this album, Sacred Fire: Live in South America, Carlos is accompanied by a dynamite band. Chester Thompson mans the keyboards, Myron Dove covers the bass, Carlos' brother Jorge Santana plays guitar, and vocalists Alex Ligertwood and Vorriece Cooper also double on hand percussion. The rhythm section includes Walfredo Reyes on the drums, and the venerable percussion duo of Raul Rekow (congas), and Karl Perazzo (timbales, congas, assorted percussion). In addition, nearly everyone in the band sings, providing a broad vocal spectrum. Performing mostly classic Santana hits, the band rips through 13 songs. Carlos, having achieved the smooth tone for which he eventually became inextricebly linked, maintains the tastiness and raw melodic sensibility for which he is justly famed. All in all, this is one of the best albums in Santana's long and distinguished career. This album is accompanied by a mostly-live video, which also includes some arty shots of Carlos playing (sans amplifier) at various urban locations. Actually, since he is well-known for never playing a lick the same way twice, he does a creditable job of mimicking his own riffs. Opening the album is the mostly instrumental "Angels All Around Us," which showcases both Carlos on very melodic lead guitar and keyboard player Chester Thomson on smoking organ chops. In addition, Karl Perazzo stands out with some very fast, very crisp timbale rolls. The band then breaks into "Vive La Vida (Life Is For Living)," an uplifting vocal song that pairs Carlos singing with Alex Ligertwood for some poppy harmonies. The song is not deep, but is laden with hooks that are quite easy on the ears. Third is the mellower "Esperando," which unveils Carlos on some rare, clean rhythm playing, as well as on vocals. This is a nice chant tune, which combines five singers on the chorus, then features Karl Perazzo rapping the verse. The rhythm is a modified reggae groove, and Carlos has two extended solos, both of which build nicely and tie in well with the song. Dynamics are well used throughout. From Santana III, the band brings out the classic "No One To Depend On." It's faster and more frenetic than the original studio version, with less of the tasty guitar harmonies evident in the original, and more of Carlos Santana out front. Although Carlos' solo is nothing like the studio version's, it is nonetheless fairly viable in its own right. Rather than alternating solo sections with another guitar player (Neal Schon, in the original), Carlos trades riffs with Chester on the organ.